SIMPSON BAY, St. Maarten (February 20, 2014) - The Princess Juliana International Airport (SXM), met with the Simpson Bay Community Council (SBCC) Wednesday evening to brief the latter about the airport’s Capital Improvement Program and engage in a dialogue concerning how some of the projects might affect the Simpson Bay Community. President of SBCC, Yvette Halley, opened the meeting with the introduction of her members, while SXM Airport Managing Director, Regina LaBega, did the same with members of her Special Projects Team who had accompanied her to the meeting. Thereafter, Robert Brown, SXM Special Projects Coordinator gave a detailed presentation to the gathering highlighting projects such as the bypass taxiway east, land reclamation, property acquisition, relocation of the fuel farm, and renovations to the cargo building. Brown also spoke about the commercial strategy and the aerotropolis concept, as well as the construction of a new state-of-the-art FBO facility, the remodeling of the airport fire department and the subsequent construction of a substation for the government fire department that will also house an ambulance unit. A lively discussion ensued during which the SBCC members tabled their concerns about some of the projects, especially where dredging is concerned. SXM disclosed that Lievense, in cooperation with the Nature Foundation, had carried out an environmental impact study, which showed that the location for dredging would be good for the lagoon and would not impact marine life. The Simpson Bay Community said it would like to be involved when such studies are being conducted as they also have a lot of information to share. 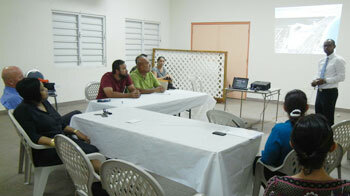 LaBega promised to share the environmental impact study with the Community Council. SXM also stressed that it must obtain permission from VROMI before it can commence work on any of the projects, such as dredging, that require such. The SBCC also suggested that SXM make the plans for all upcoming projects available on the company website. “We will surely consider the feasibility of the suggestions made by the Council during the meeting and assess these in line with the airport’s safety and security requirements as well as compliance with ICAO and FAA regulations,” LaBega concluded.